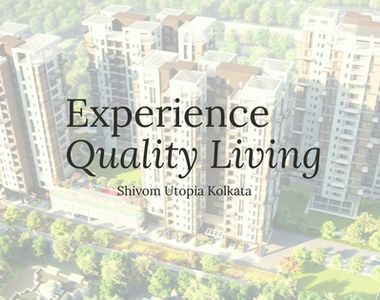 Homeowners looking for a quality apartment in Kolkata must have a look at Shivom Utopia. The residential complex has been developed in Madurdaha, and the residents can go for these sophisticated apartments now. The estate brings you a wide range of amenities that will refine your lifestyle. The residential complex comes with 2, 3 and 4 BHK apartments. The prices of these apartments are likely to rise in the coming months. Investors and homeowners from various parts of the city are interested in buying these apartments. In case you are willing to get an apartment in this residential complex, you can make your investment now. Kolkata is one of the most popular residential hubs in the country. It has got an enriched cultural heritage, and the social infrastructure in the city is well-developed. The residents can cherish their housing dreams when they get an apartment in the residential complex. 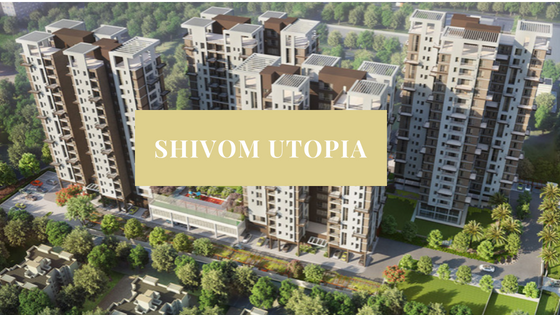 The Shivom Utopia price is on the rise, and this is the right time for you to buy these apartments. If you have a fascination for green living, you can get your dream home here. The residential complex comes with extensive green zones and open spaces for the residents. You can enjoy an urban lifestyle close to nature when you move to the residential complex. The residents can spend their time in the walkways in the garden, or sit in the balconies, enjoying the beauty of greenery around. The apartments in the residential complex are spacious and are integrated with sophisticated furnishings in the interiors. You will love the elegance and comfort of these apartments. The floor planning in the complex has been intelligently made. This leaves a wide area for public use in the complex. The residential complex comes with a cricket pitch and a yoga area for the residents. It also has an indoor games room and outdoor table games for the residents. The homeowners can enjoy the podium level grand lawn in the complex. They can also spend their time in the sit-out areas and amphitheater. The complex comes with a library for the book lovers. Children can play in the dedicated play areas in the complex. The residents can arrange for meetings and conferences in the banquet. The residents can spend quality time in the clubhouse, socializing with others. Health and fitness enthusiasts will have a good time in the complex. They have a lot of activities to engage with. The residential complex comes with a swimming pool and gym for the residents. 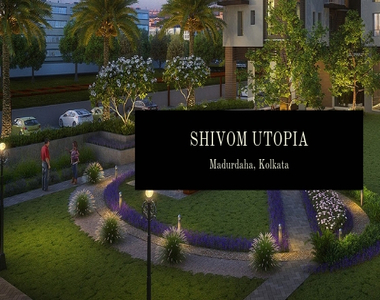 The residents in Shivom Utopia Madurdaha can get a quick access to the important schools and hospitals in the area. The prominent schools close to the residential complex include Calcutta Public School, Delhi Public School, Calcutta International School, The Heritage School, Indus Valley World School, Garden High School, and DPS Ruby Park Junior School. The important hospitals close to the area include AMRI Hospital, Medica Superspecialty Hospital, Ruby General Hospital, Desun Hospital, Genesis Hospital, Devi Shetty Hospital, Fortis Hospital, and Peerless Hospital. The transportation system in the area is well-developed. The residents can navigate through the city through the dense network of roadways. The important commercial zones in the city, including Park Street, Central Avenue, BBD Bag, and Salt Lake can be easily reached from the residential complex. Besides, the residents can get across to the airport at Dumdum in quick time from the estate. Besides, you can also reach the important railway stations at Howrah and Shealdah from your homes easily. Investors and homeowners willing to buy Property in Madurdaha should make their investment now. The prices of property in the area are on the rise. Get a classy home here and experience the luxury. You can enjoy the green living facilities while residing close to the important commercial zones in Kolkata. Space For Artificial Cricket Pitch.